A new ad will be creating conversations and opportunities for senior living communities and long-term care facilities to share where they stand on housing lesbian, gay, bisexual and transgender older adults. Discrimination in senior living may not happen exactly that way, but LGBT residents have sued communities over issues of discrimination. 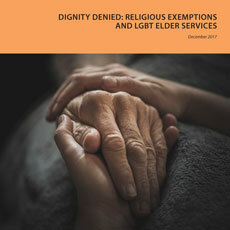 The release of the ad follows this month’s Supreme Court ruling in Masterpiece Cakeshop v. Colorado Civil Rights Commission; the March release of an AARP study that found that worries about potential neglect, abuse, access to services and harassment in assisted living communities and other long-term care settings are common among LGBT adults; and the January announcement of a new Conscience and Religious Freedom Division of the U.S. Department of Health and Human Services, which LGBT advocates fear will allow discrimination. SAGE says it is concerned that 60% of states do not have laws that explicitly prohibit discrimination against LGBT people and that no federal law exists to protect LGBT people from discrimination. Also, SAGE says, approximately 85% of nonprofit continuing care retirement communities are affiliated with a religion, which could put some LGBT older adults at risk. There are several ways that senior living organizations can express or strengthen their support for LGBT issues. SAGE has created a pledge for care providers who vow to stand with LGBT elders in the face of discrimination. You’ll find it online as part of the organization’s “Care Can’t Wait” campaign, which is part of the larger “Open to All” campaign. What else can senior living operators do to create such an environment? An additional option is to read the ideas shared in a recent blog post by Brookdale Senior Living Senior Director of Optimum Life Engagement and Innovation Carol Cummings, BSN, RN. She passes along tips from a February continuing education event, “LGBT Elders: Best Practices for Creating Safety and Inclusion,” held by the company. The need to know such best practices is only going to grow. SAGE estimates that by 2030, there will be approximately 7 million LGBT older people in the United States. So if your organization hasn’t started yet or wants to grow in this area, there’s no time like the present.